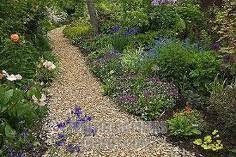 A wood chip path is the embodiment of things ‘natural’. Its main drawback is its unsuitability for steeply sloping sites; heavy rain will tend to wash it away. First, flatten the area by taking off the high spots and filling the low. Poison all grass and weeds. Lay the shade cloth or weed mat; stretch it first, then hold it in place with rustproof tent pegs. If these are too expensive for your budget, buy a few lengths of thin metal rod and make them yourself. Spread the chips to a depth of 30-40 mm. Spray poison on any weeds that may still appear. Unfortunately, the chips lose their looks fairly quickly and will eventually disintegrate, necessitating replacement or retopping. Walking on them in bare feet is also not the most enjoyable experience and neighborhood cats sometimes use them as litter. But they look good! A great idea! Looks like the garden is beautiful too. We used wood chips here on kiddie parks, so that the kiddos don't get hurt bad when they fall from the monkey bars, or see saw or something. and we use wood chips too in the garden to avoid too much weeds.